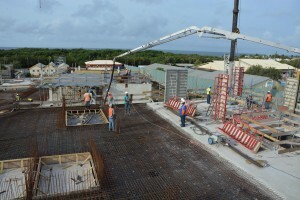 WILLEMSTAD – The consultant that supervises the construction of the new hospital in Otrabanda, Berenschot received 3 million guilders from the financial institution SONA. The remaining 3.3. million of the agreed 6.3 million will be paid this week. According to Berenschot this will remedy the most urgent liquidity problems and the construction of the hospital will be resumed shortly. The Curaçao government has signed a management agreement with SONA on the realization of the new hospital. SONA in turned entered into a management agreement with Berenschot. Under this agreement, Berenschot performs, under the name USONA, the duties and responsibilities assigned to SONA in the management agreement. Because of the lack of accountability on the part of Berenschot, SONA has stopped the payments at the beginning of this year. Berenschot then decided to halt the construction works. Now that both parties reached an agreement, with the assistance of the mediator Etienne Ys, former Prime Minister of the Netherlands Antilles, the construction of the new hospital can continue.